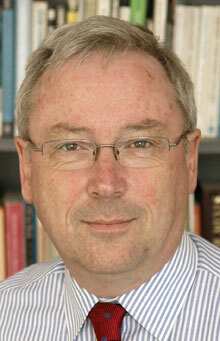 Richard Murphy (61) is a chartered accountant and a political economist. He has been described by the Guardian newspaper as an “anti-poverty campaigner and tax expert”. He is Professor of Practice in International Political Economy at City University, London and Director of Tax Research UK. He is a non-executive director of Cambridge Econometrics. He is a member of the Progressive Economy Forum. Richard was a co-founder of the Tax Justice Network and Green New Deal, as well as the Fair Tax Mark. In 2015 Richard was named as the Economic Justice Campaigner of the Year by the Sheila McKechnie Foundation. In 2015 Richard Murphy became known as the man behind Corbynomics. The relationship did not last. He is not a member of any political party. We've got to take sides on tax. Rich individuals, corporations, well-funded special interest groups and much of Fleet Street is on one (the wrong) side and then there is Richard Murphy plus a few others, including yours truly. But it is Murphy who is the heroic figure. Tireless and forensic, driven by an admirable moral fervour, I take my hat off to a campaigner with Duracell batteries. Polly Toynbee of the Guardian has described Richard's work as 'razor sharp' and the 'fuel that drives so much of the tax campaign'. A graduate in Economics and Accountancy from Southampton University he was articled to Peat Marwick Mitchell & Co in London. He subsequently founded a firm of accountants in London which he and his partners sold in 2000. In parallel with his practice career Richard was chairman, chief executive or finance director of more than ten SMEs. Since 2003 Richard has been increasingly involved in economic and taxation policy issues. 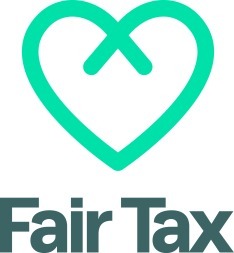 He was a founder of the Tax Justice Network and is director of Tax Research LLP which undertakes work on taxation policy, advocacy and research for aid agencies, unions, NGOs and others in the UK and abroad. 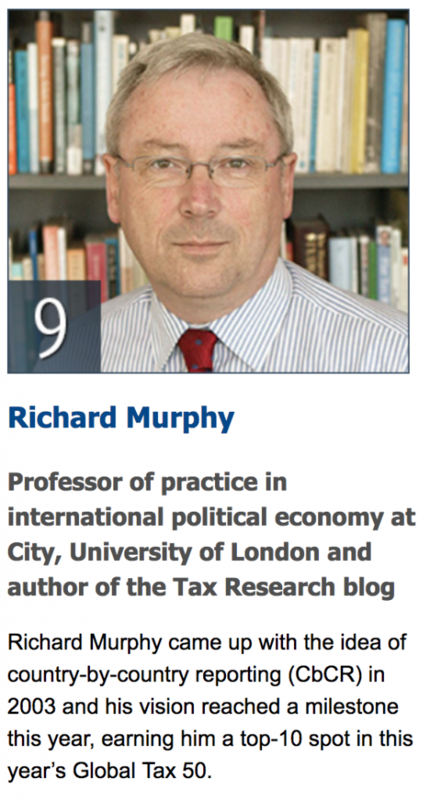 Richard Murphy has been responsible for introducing many new issues into debates on tax policy. In particular he created the entirely new accounting concept of Country-by-Country reporting that is now being considered for adoption by the European Union, Organisation for Economic Cooperation and Development, International Accounting Standards Board and others. Country-by-Country reporting requires a multinational company to publish a proper loss account each and every jurisdiction in which it trades, without exception, and is seen as as a mechanism for holding multinational corporations to account for their activities in developing countries, the extractive industries and tax havens. It will also assist the monitoring of corporate transfer mispricing and is believed to cost developing countries tens and maybe hundreds of billions of dollars a year as well as corporate tax and governance risk in multinational corporations. As principal researcher of the Tax Justice Network from its inception until 2009 Richard helped put the tax haven issue on the international agenda. Following the restructuring of the Tax Justice Network in 2013 Richard no longer acts as a spokesperson for that organisation. Richard’s work for the TUC, PCS and others on the tax gap in the United Kingdom has also put this issue on the UK tax agenda. It was not part of taxation debate until the TUC published his report ‘The Missing Billions’ in 2008. It is now the main priority of H M Revenue & Customs’ business plan. Richard is also a principal author of many of the proposals made by the Green New Deal group in the UK, which has had a significant influence on political debate in the UK and beyond. He has written extensively on tackling the UK’s deficit without imposing cuts on the most vulnerable in society. Richard has written widely, and blogs frequently. He has appeared in many radio and television documentaries on taxation issues. He has also presented written and oral evidence to select committee committees of the House of Commons and House of Lords. Richard has been a visiting fellow at Portsmouth University Business School, the Centre for Global Political Economy at the University of Sussex and at the Tax Research Institute, University of Nottingham. He is a co-author of 'Tax Havens: How Globalization Really Works', Cornell University Press, 2009 and author of 'The Courageous State', Searching Finance, 2011, 'Over Here and Under Taxed', Vintage Books, 2013 and The Joy of Tax, Random House, 2015. This one attracted the attention of David Cameron. His most recent book is on the political economy of tax havens was published in February 2017 by Verso. Richard was voted the seventh most influential left wing thinker in 2010/11 in a Left Foot Forward poll, making him the highest ranked UK based economist on the list. In October 2012 the Association of International Accountants gave him their award for an Outstanding Contribution to the Accountancy Profession. In December 2012 Economia magazine, published for the Institute of Chartered Accountants in England and Wales, named Richard as the most influential chartered accountant in the UK's social media. He repeated this feat in 2013, being named number 7 overall and number one chartered accountant in the ICAEW's Economia magazine list of go-to sources for financial news in the world of social media. An academic study published in March 2013 found that Richard had been the fourth most effective user of Twitter in opposing NHS reforms in 2012. In September 2013 Richard was given a special recognition award by the Sheila McKechnie Foundation for this work campaigning for tax justice. Richard is also a technical adviser to Tax Justice UK, holds a practicing certificate as a chartered accountant but makes almost no income as a result of doing so now, and is a director of Progressive Pulse Limited and Finance for the Future LLP, neither of which trade. He is a non-executive director of Cambridge Econometrics.